What happens when metals rust? Metal oxidation takes place when an ionic chemical reaction occurs on a metal's surface while oxygen is present. Electrons move from the metal to the oxygen molecules during this process. Negative oxygen ions then generate and enter the metal, leading to the creation of an oxide surface. Oxidation is a form of metal corrosion. This chemical process can occur either in the air or after metal is exposed to water or acids. 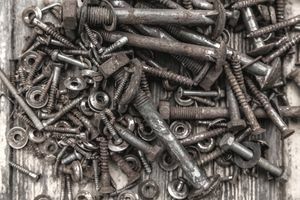 The most common example is the corrosion of steel, which is a transformation of the iron molecules on steel's surface into iron oxides, most often Fe2O3 and Fe3O4. Noble metals, such as platinum or gold, resist oxidation in their natural state. Other such metals include ruthenium, rhodium, palladium, silver, osmium, and iridium. Many corrosion-resistant alloys have been invented by humans, such as stainless steels and brass. Metals that resist oxidation are the opposite of the metals prone to it, known as the base metals. Examples of base metals include copper, lead, tin, aluminum, nickel, zinc, iron, steel, molybdenum, tungsten, and other transitional metals. Brass and bronze, the alloys of these metals, also are classified as base metals. Preventing corrosion has become a lucrative industry. No one wants to drive in a rusted car if they can help it. But corrosion is more than just a cosmetic concern. Corrosion can be dangerous if it affects infrastructure such as buildings, bridges, sewage pipes, the water supply, ships, and other vessels. Corrosion can cause infrastructure to weaken, putting lives at risk. So, while corrosion prevention may be costly, it certainly is necessary. A high-profile crisis with drinking water in Flint, Michigan, began in 2014 and serves as an example of how corrosion can have devastating effects on people's lives. The Water Research Center offers some warning signs that your water might have been impacted by corrosion on some level. If you find you need to run your water for a brief period of time to eliminate discoloration or a bitter taste, there's probably an issue with corrosion in your pipes. Blue-green stains in basins or along the joints of copper piping are another sign of possible corrosion.